The Gorkha Janmukti Morcha (GJM) has written to the Home Ministry regarding the death of their three supporters by police firing on June 17, asking for a Central Bureau of Investigation (CBI) enquiry into the same. Iterating that they don't have faith in the state police and administration, the party sought Home Minister Rajnath Singh's involvement in initiating an inquiry by a central agency. "We would appeal to you that whatever cases have been filed by the state government either be quashed or be transferred to the CBI at the earliest," the letter read. The GJM termed the recent violent incidents as 'unprecedented violation of human rights by West Bengal Police'. 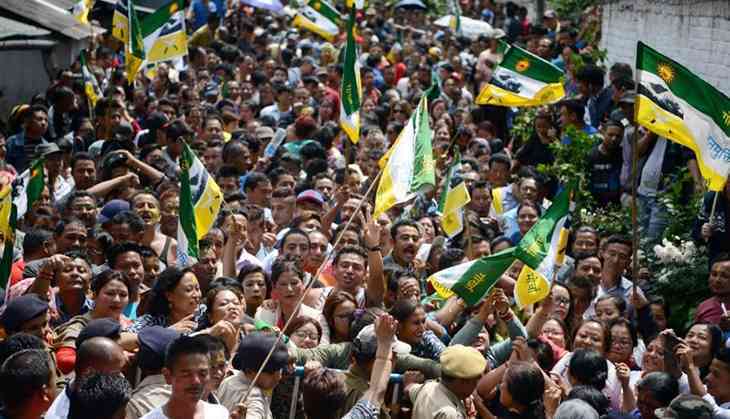 Three GJM protestors were killed in clashes that broke between out in Darjeeling on June 17, the sixth day of the party's indefinite shutdown demanding a separate Gorkhaland. Apart from this, the party also highlighted other incidents which happened around the same time. "There were three other incidents of similar excessive police action, one on June 8, when peaceful protestors were tear-gassed and lathi-charged. Another on June 13 and the third on June 15 when police raided the office of a political party and the residence of the chief executive of the Gorkhaland Territorial Administration, who holds a constitutional post in the rank of a state cabinet minister," the letter read. Meanwhile, the Gorkha Janmukti Yuva Morcha (GJYM) yesterday informed that it would go on a hunger strike in Delhi and Darjeeling. GJYM general secretary Amrit Yonzon said the party would go for the strike after the all party meet on July 6. Meanwhile, in the wake of indefinite protests being conducted by the GJM demanding a separate state Gorkhaland, the GJM has asserted that Gorkhas of Darjeeling are not safe in West Bengal. GJM General Secretary Roshan Giri told ANI, "We are not safe in West Bengal. People here, aspire of a separate state, which should be fulfilled."